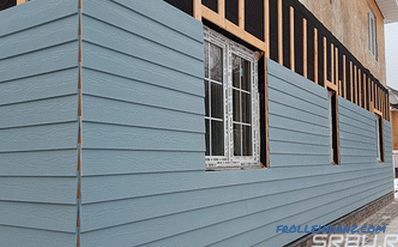 Siding is a wall cladding for a curtain wall. These are flat, profiled longitudinal lenses, which are sewn onto the frame subsystem attached to the base wall. 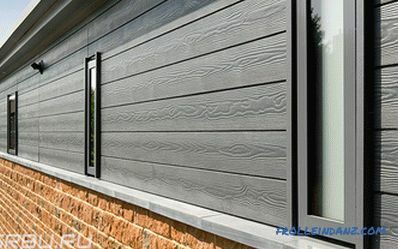 When deciding on a hinged facade, you have to decide which siding is best for house cladding, since there are several types of them, and there are some features of their use. Vinyl siding is the most popular. It is made of polyvinyl chloride - plastic, characterized by chemical inertness and wide temperature range of operation. The longitudinal profile gives the panels the required bending stiffness with a small sheet thickness. Acrylic is a siding with a vinyl base and a face layer of acrylic. Vinyl provides the necessary mechanical qualities of the panels, and acrylic, due to its higher resistance to sunlight, makes it possible to obtain a lining with bright, durable color. 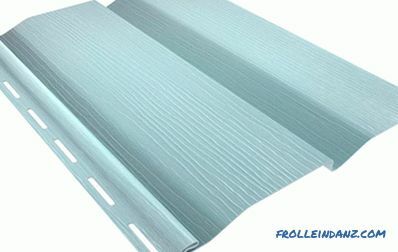 Metal siding is made by cold rolling from a thin steel sheet. 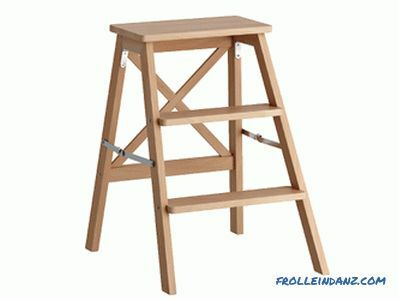 Forming a profile gives the panels a fairly high strength with a small thickness of the source material and low weight. Metal siding is protected from corrosion by galvanizing and polymer paint. powder paint, from which, when exposed to a furnace, a strong protective and decorative film is obtained that withstands deformation metal, exposure to moisture and sunlight. 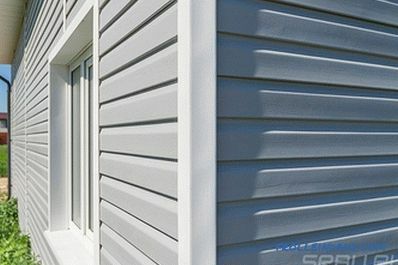 Fiber cement siding is made from a mixture of cement with mineral fillers and fiber. Fiber is a thin glass, polymer or cellulose fiber that creates dispersed reinforcement in the entire volume of the panels and gives them strength and resistance to cracking. 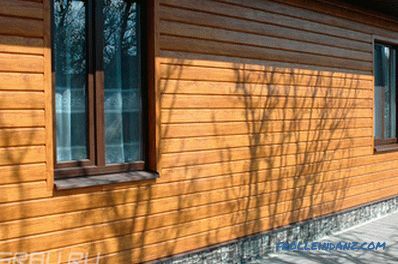 When deciding which siding to choose for a specific case, it is necessary to determine the conditions for its use and select the material with the most suitable characteristics. Next, we compare the above types of siding in the main parameters. The hinged facade usually does not have high strength requirements, so the cladding material is usually calculated for wind loads and is quite easily damaged by concentrated mechanical effects. Fiber cement siding has the highest strength. Its slats have a thickness of 10-12 mm and easily withstand most of the loads that can occur during operation - a push with a hand, a ball hit, etc. This casing is sometimes used in the basement part of a building, where such loads are most likely. Metal siding is less durable due to small wall thickness. In an effort to reduce the material consumption of the skin and reduce its weight, manufacturers of metal cladding use a thin sheet, and bending rigidity is achieved by forming a profile that increases the structural thickness of the slats. 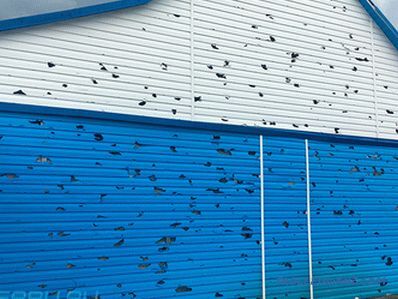 Metal siding withstands fairly large loads, but when a certain limit is reached, which depends on the thickness of the metal, the height of the profile and the pitch of the subsystem, dents appear on it, which can only be removed by replacing the panels. 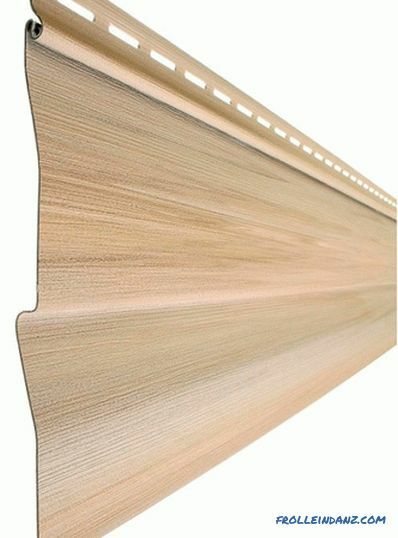 Plastic siding is relatively easily deformed, but just as easily regains its shape, if the elastic limit is not exceeded. Due to this quality, it successfully serves as facade cladding. At low temperatures, the plastic becomes more fragile and may burst from shocks that pass completely in the warm season. The lower limit of the safe temperature, -50 o C, is practically unattainable for most regions. In the summer heat, the material approaches the state of fluidity, but up to +50 o C, the elasticity of vinyl remains quite high. 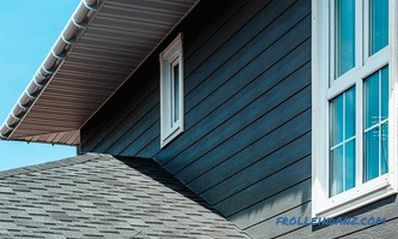 Acrylic siding withstands stronger heat - up to +80 o c.
Damage to vinyl siding in a major hail. The service life of facade cladding is related to its strength, but not always “strong” means “durable”. This parameter is influenced by various factors, and it is not always possible to unambiguously indicate the most durable material. We will understand this issue. Among the considered types of facade cladding, fiber cement siding gives the greatest hope in terms of durability. This material is theoretically eternal, because in essence it is a stone reinforced by fibration. However, moisture and low temperature make corrections to the service life of this lining. If the panels are not protected from moisture and operated in a cold climate, they are subject to frost destruction. High-quality cement lining should have a frost resistance at the level of 100-150 cycles, which means 20-50 years of trouble-free operation at normal humidity. To heat the sun, this material is completely indifferent. If the operating conditions of the facade do not contribute to the appearance of moss, mold, microscopic algae on its surface, its appearance remains unchanged throughout its life. Mineral dyes are used for coloring, which over time do not lose color. Iron corrosion calls into question the durability of the steel sheet facade cladding. But then help out modern protective coatings. A layer of zinc forms a galvanic couple with iron, which prevents its oxidation, and the polymer paint serves as a reliable protective layer resistant to mechanical damage and cracking. The service life of metal cladding - at least 10 years. Today, manufacturers guarantee up to 20-25 years of operation without significant signs of rust. Metal siding does not react to low or high temperatures. 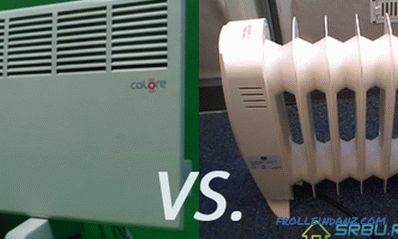 It does not suffer frosty damage, does not become brittle in the cold, does not lose strength when heated. The only thing to consider when installing is the thermal elongation of the slats. The whole service life the appearance of the siding practically does not change, except for the burning out of some helmets. Over time, the color of the facade may lose the initial saturation. 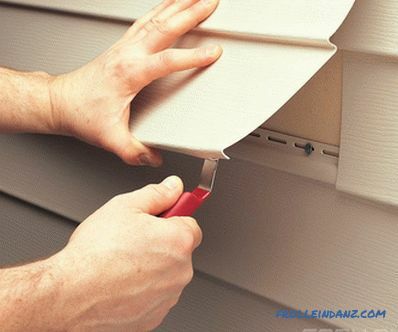 Plastic siding, despite the instability of PVC, is the most durable, subject to the conditions of its use. The claimed lifetime is 50 years. the resistance of the plastic to UV radiation is provided by the addition of stabilizers. Despite the use of photo stabilizers, the color of PVC changes over time. The coloration loses its intensity, and the white plastic may become yellowish. 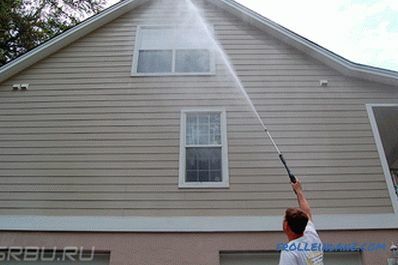 Therefore, vinyl siding is painted in light colors with low saturation. In order to get richer colors, an acrylic face layer is used. Acrylic is more resistant to heat and UV. It is much less prone to fading. 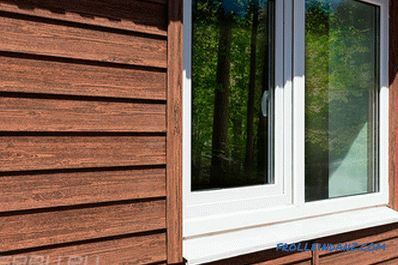 Even on the basis of these parameters, you can understand which siding is better - vinyl or acrylic. Acrylic siding expands the design possibilities and allows longer preserving the bright colors of the house. The temperature range of the plastic sheathing is limited, but wide enough. As a rule, heating by sunlight does not lead to a decrease in strength. In severe frost siding can become brittle and burst from a not too strong blow. Another feature of PVC is its high thermal expansion coefficient. This feature must be taken into account when installing the facade. The main and perhaps the only danger associated with the use of hinged facade systems is the danger of fire. This problem is especially important for facades with a ventilated layer. The thrust that arises in the ventzazore inflates the fire and quickly spreads it across the wall. 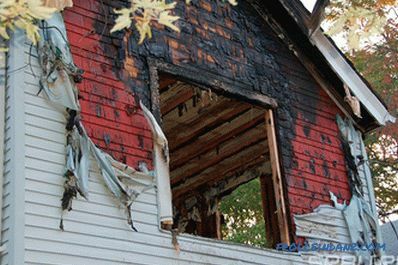 Fiber cement siding has the greatest fire resistance. It not only does not burn, but is able to survive the local effects of fire without any special consequences. Metal siding is also completely non-flammable. But when exposed to fire, it loses its appearance, loses corrosion protection and becomes unsuitable for further use. PVC can be made to burn. But this plastic does not spread the flame and burns only when exposed to external influences, fading when the heating stops. Facial acrylic layer does not change the overall picture. Vinyl siding after a fire. Environmental friendliness of any of the options considered is not satisfactory. Some advantage can be attributed to fiber cement lining, since it contains only natural ingredients. 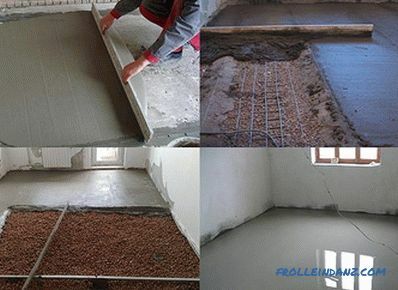 However, polymer modifiers can also be added to the cement mixture. For ease of operation and maintenance of the surface plastic - out of competition.Its smooth surface is easily cleaned from dust and dirt. Even strong scratches are imperceptible on it, since superficial damage does not lead to discoloration. Metal siding is also easy to maintain. But any scratches need to be painted over to restore the appearance and corrosion protection of the facade. Fiber cement siding, like plastic, is not sensitive to minor damage. The disadvantage may be some porosity of the material. It can make it difficult to clean the surface, and in some cases a green coating may appear on the skin that is very difficult to repair. When choosing a variant of a hinged facade, you need to consider the convenience and simplicity of its use, as well as the cost of acquiring the material, its delivery, and labor-intensive installation. Metal and plastic siding are leading in terms of ease of installation. Their lamellae are easy to manipulate, hold in place until locked. Metal siding is somewhat heavier than vinyl, but in most cases this difference can be neglected. 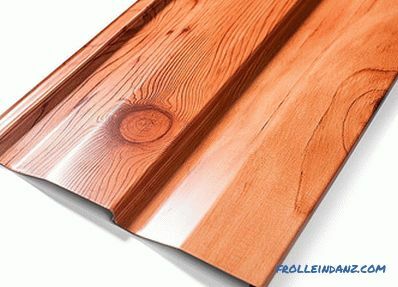 When deciding which siding is better - vinyl or metal, it is worth considering that vinyl is easier to cut and bend. When mounting, various techniques are often used related to bending the notched parts, which is much easier to do in the case of plastic. Vinyl parts can be bent significantly without permanent deformation, which also simplifies the work. Due to the simplicity of installation, vinyl and metal siding are not expensive. Plastic is particularly economical, since the material itself is cheaper. 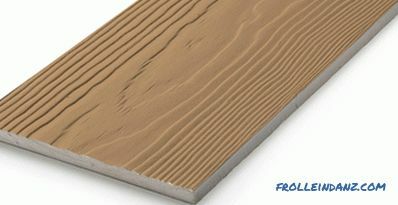 Fiber cement siding is not cheap to purchase and more difficult to install. 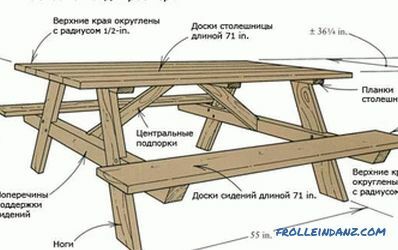 It has more weight, which places higher demands on the subsystem. This also increases the final cost of the curtain wall device. The best material, as always, is the one that best suits the task and meets the conditions of use.